1 – One of several spots in the UK pavilion at Epcot: the garden at the back of the UK pavilion, the little garden that’s tucked behind the tea shop, and the UK Lower Terrace, accessed via the ramp at the side of the Rose & Crown Pub & Dining Room. 2 – On the beach at the Polynesian Resort, especially in the evening. The tiki torches are lit, and you can hear the Hawaiian music drifting over from the Spirit of Aloha dinner show. Later on the night sky is lit up across the lagoon by Wishes fireworks, followed by the Electric Water Pageant floating by. Take your pick from hammocks, swings or sun loungers. Don’t forget the mosquito repellant if you’re there at dusk! 3 – Wandering around the Discovery Island Trails in the Tree of Life Garden in Animal Kingdom, getting a close-up look at the wonderful animal carvings. 4 – Listening to the piano player in the lobby of the Grand Floridian Resort – cocktail in hand optional! If you’re there in an afternoon, why not treat yourself to afternoon tea in the Garden View Lounge – a delicious way to relax! 5 – There are a few nice (relatively) quiet places around the Magic Kingdom hub area: In the small garden next to the Crystal Palace, in front of the Baby Care Center and first aid; in Cinderella’s Rose Garden, to the right of the Castle down by the old Swan Boat dock; and sat at one of the tables in front of Plaza Ice Cream Parlor or Casey’s Corner. 6 – At the rear of Epcot’s Canada pavilion, sat on one of the benches next to the waterfall. 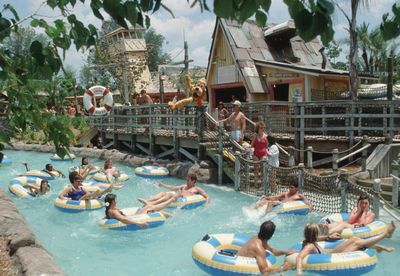 7 – Floating along on the lazy rivers at one of Disney’s Water Parks, Cross Country Creek at Blizzard Beach or Castaway Creek at Typhoon Lagoon. 8 – Take a boat ride! Test out your sea legs by hiring one of the many forms of watercraft available at the WDW Resorts, including Sea Raycers and Pontoon Boats. There’s nothing like sailing by the Magic Kingdom on the Seven Seas Lagoon on a sunny afternoon. If you want a free boat ride, catch the ferry boat from the TTC to the Magic Kingdom, or one of the friendship launches that run between the Epcot Resorts and Epcot and Disney’s Hollywood Sudios. 9 – For a non-static relaxation break, take a spin on the Tomorrowland Transit Authority. The Magic Kingdom attraction takes a slow, meandering ride around Tomorrowland, passing through Space Mountain and Buzz Lightyear’s Space Ranger Spin. 10 – Sitting on a rocking chair enjoying the peace and quiet of Tom Sawyer Island, with the hustle and bustle of the Magic Kingdom just a stones throw away. It was a tough job narrowing down the list to just 10 choices, there are many more places I could have included. 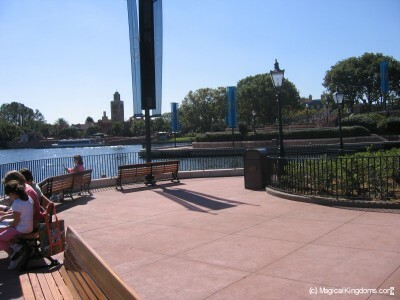 With lots of quiet places to relax at the Disney Resorts, and quiet indoor attractions at the Theme Parks. If your favorite place isn’t listed above, reply and let us know where you like to relax at Walt Disney World! We just got back from six weeks at “the world”. Several of these spots became some of our favorite places to take a break from the hustle and bustle of the summer crowds. We love the garden at the U.K.. It has a nice bonus of shady benches and the great music of The British Invasion. Another relaxing acitivity that we found was taking the boat launch from Magic Kingdom to the Grand Floridian upon leaving the parks at night. The small group atmosphere is much quieter than the crowded ferryboat or monorail. The lull of the boat skimming across the water is a nice way to wind down after hot summer day full of activity. You’d never think of Disneyland as a relaxing place so some great spots there!